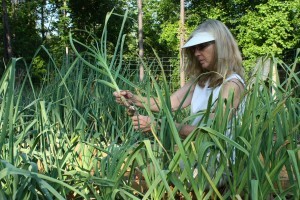 We’ve been busy this week harvesting onion, and especially garlic. This week’s program is all about when, where, and how we planted it, how we’re curing it, and how we plan to store it after it’s cured. 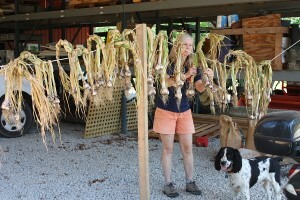 Amanda’s pulling the Italian garlic this week; the Silverskin’s still a couple of weeks out. Oddie seems to approve Amanda’s technique as she hangs freshly harvested garlic on our makeshift drying rack in the barn.